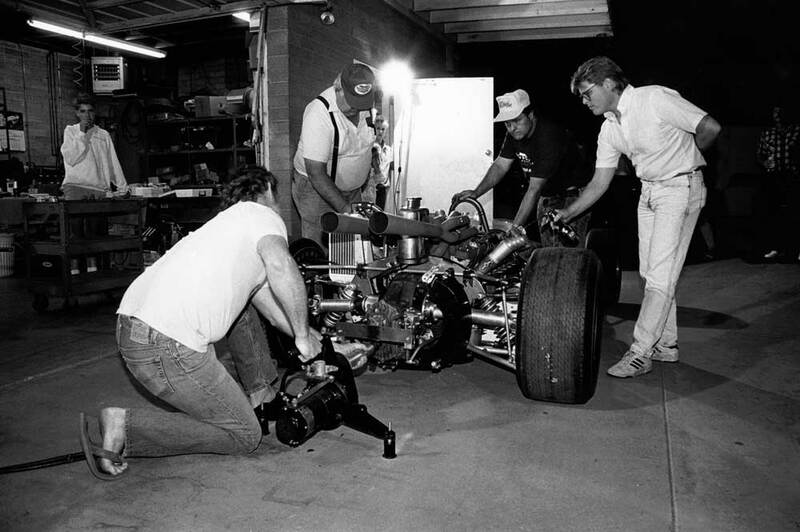 To most race fans who can rightfully be called baby boomers at least, AARP-candidates at most, it may seem hard to believe that front-engined Indy roadsters have now been extinct for four decades. 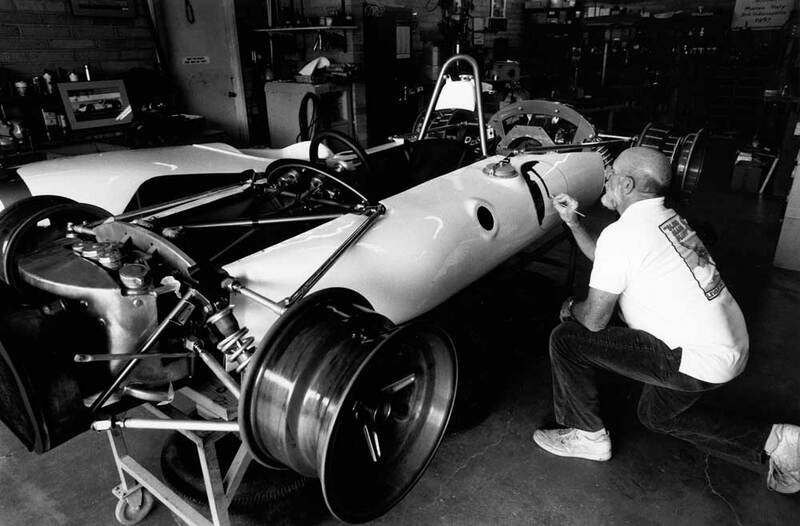 Yet history shows that beginning in 1961, with the appearance of Jack Brabham’s tiny Cooper-Climax, the roadster’s fate was sealed. 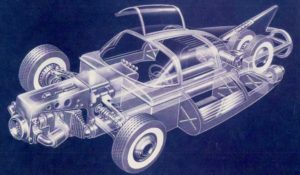 By 1964—the last year a roadster won at the Brickyard—the rear (mid) engined car was not just the hot setup, it was the only setup. And by the following year’s Memorial Day 500, a brand new genre of smaller, lighter and a whole-lot-faster Indycars had completely taken over American pavement racing. 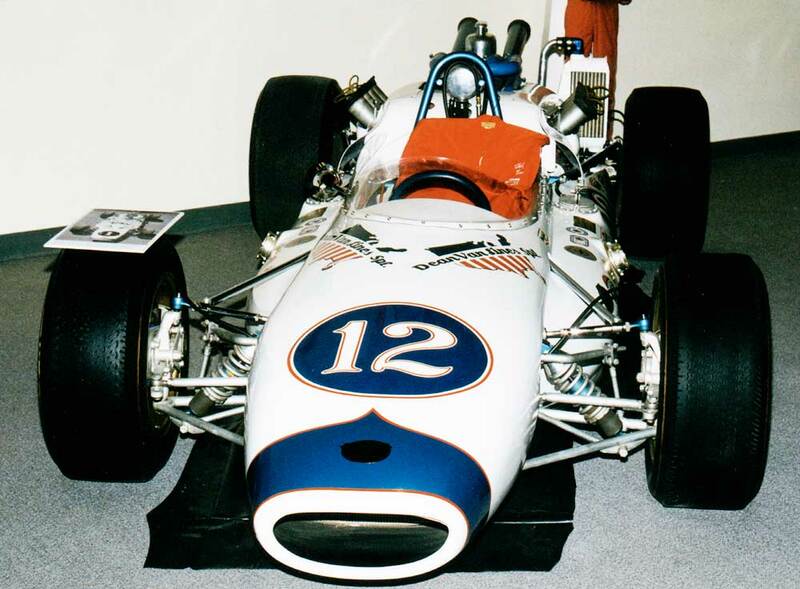 One such machine was Mario Andretti’s 1965 Brawner-Hawk. 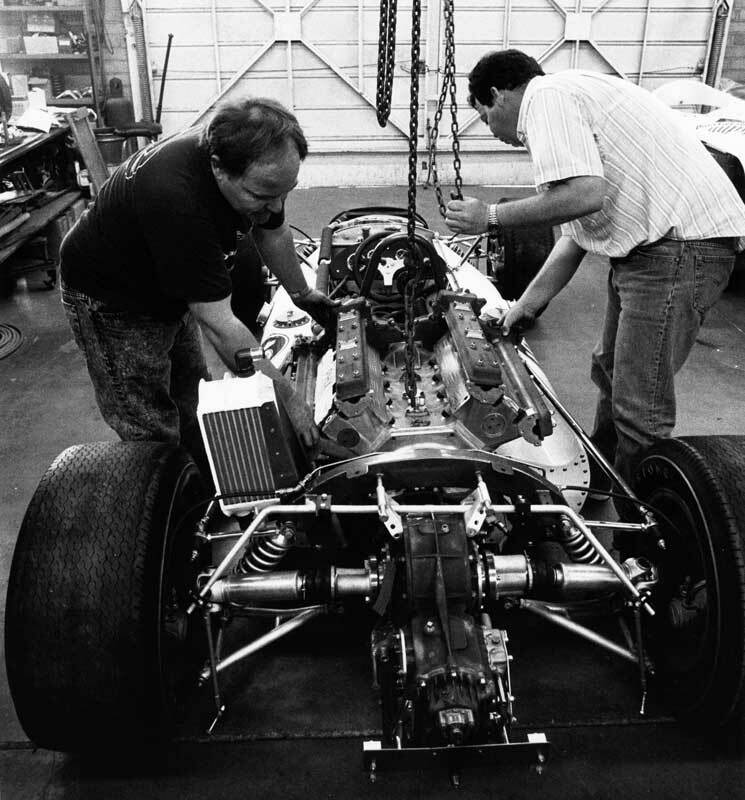 The Hawk was built at the crossroads of progress, when frames were still welded cages of chrome moly steel tubing instead of monocoque tubs built from aluminum first, carbon fiber twenty years later. 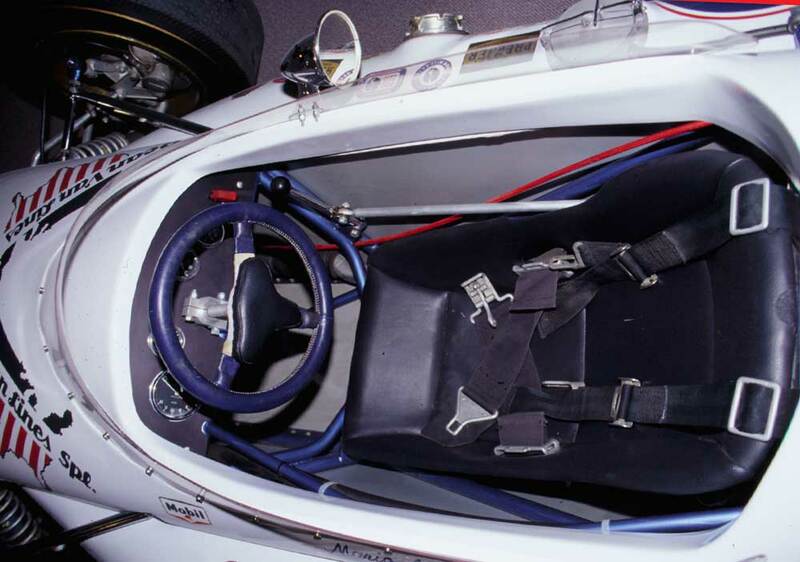 At a time that many believe was the true golden age of Indy racing, the Hawk was a prime example of the last generation of race cars that could actually be built by hand—provided the builder/designer/dreamer had the necessary skills and temperament. Clint Brawner was certainly one of those men. 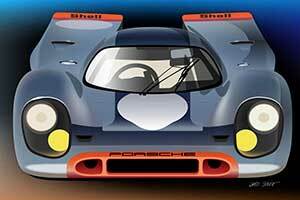 The Hawk was hatched in the winter of ’65. 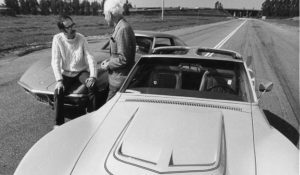 Realizing they had absolutely no experience with building rear-engined race cars—but knowing they had no chance to win Indy without one—Clint Brawner struck a deal with fellow USAC car owner John Zink. 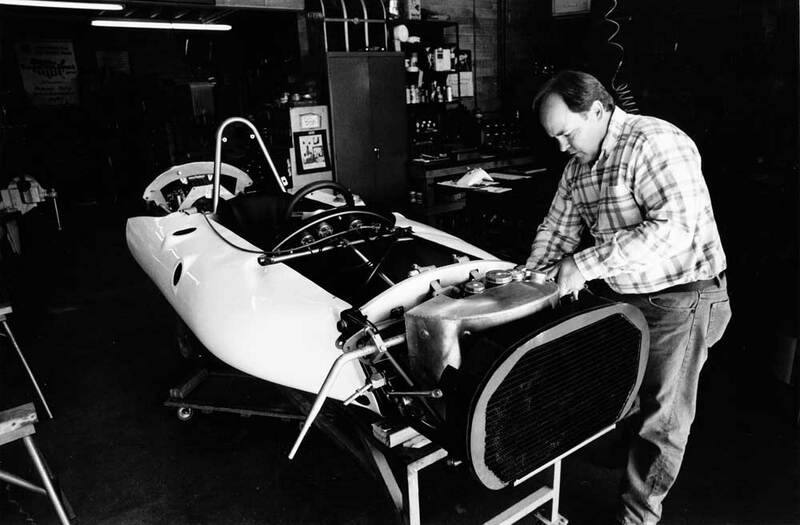 Zink had bought a new Brabham/Ford for driver Jim McElreath, but the car was destroyed beyond repair in a testing accident. 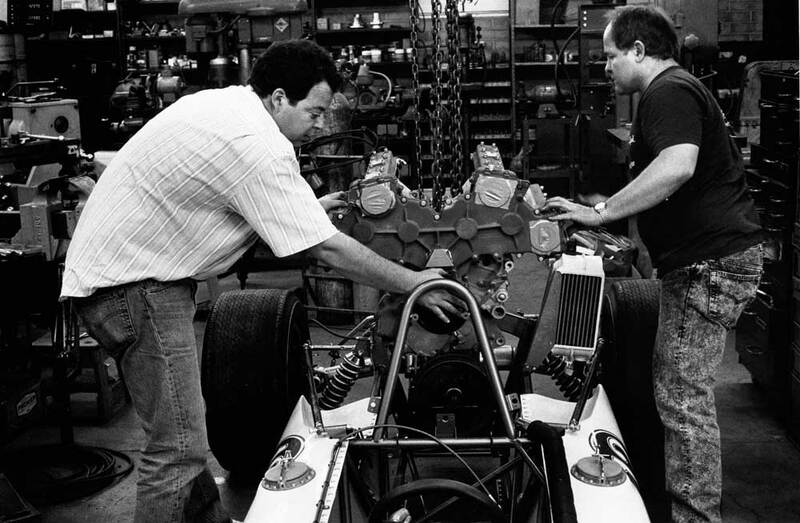 Brawner wanted to buy the wreck and build his own car from the specs, but Zink told Clint the only way he was going to raise a new car from the Brabham’s ashes was by building two new cars, and giving one to Zink. Clint agreed. 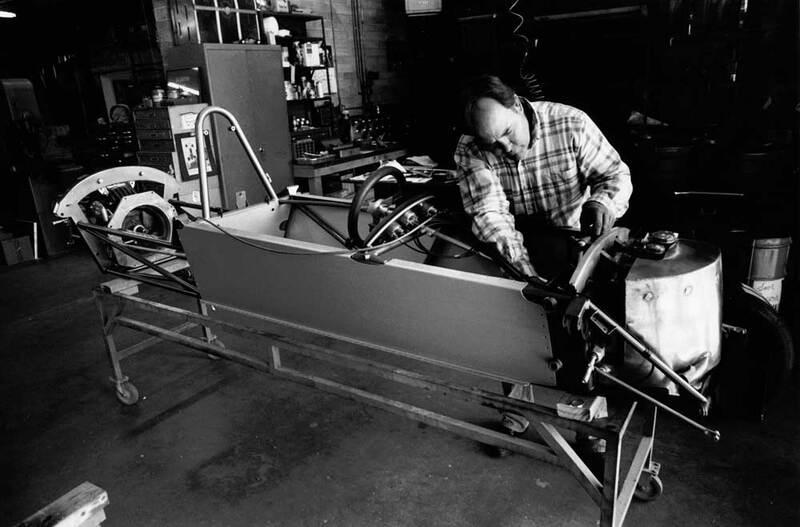 He and Jim McGee moved the wrecked racecar into their shop and carefully disassembled it, taking precise measurements and studying the chassis, suspension, steering, drive line, everything. 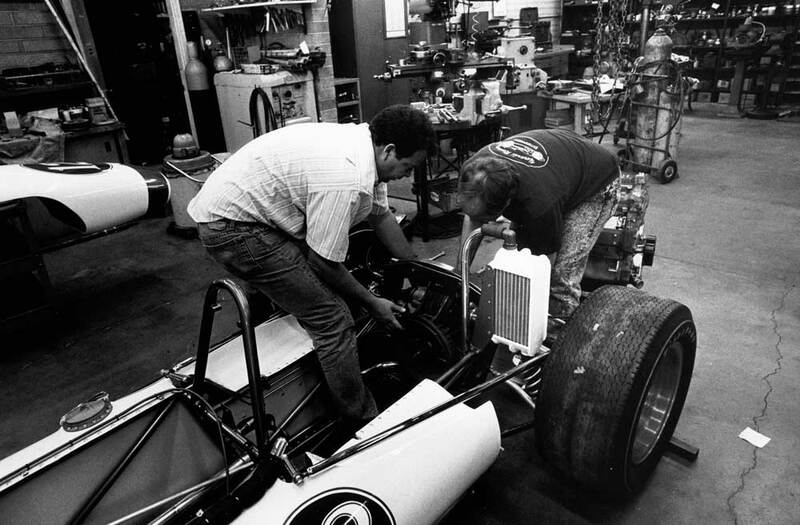 Then, using the standard 4130 steel tubing so common to all race cars of that time, they welded together a brand new chassis as the basis for their new champ car. 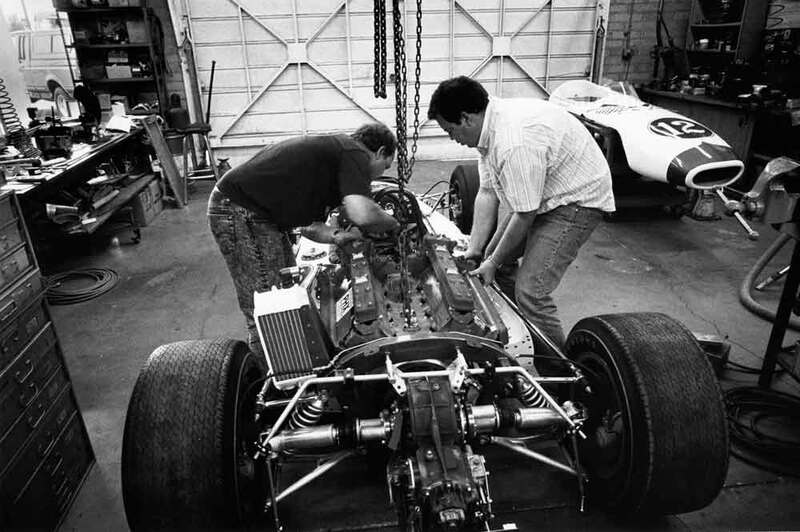 They installed the Ford DOHC engine and 2-speed transaxle, fabricated and mounted the suspension pieces and steering, and within weeks had a brand new, rear-engined race car. 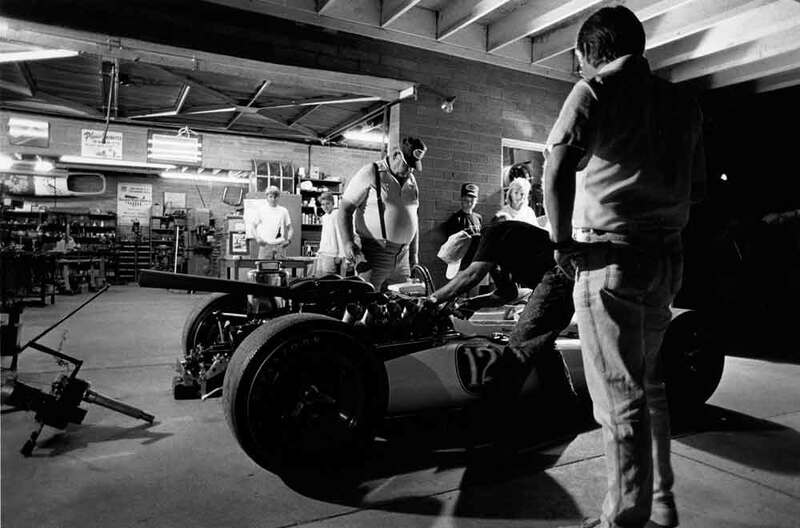 Yes, it was based on the Brabham, but with a few slight modifications and improvements that could only come from the hands and mind of Clint Brawner. 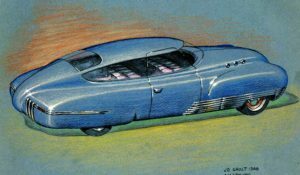 They christened the new car ‘Hawk’ and then built another car just like it. 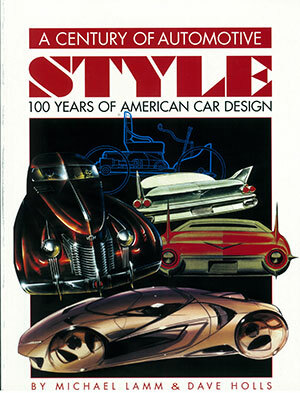 The rest, of course, is history. 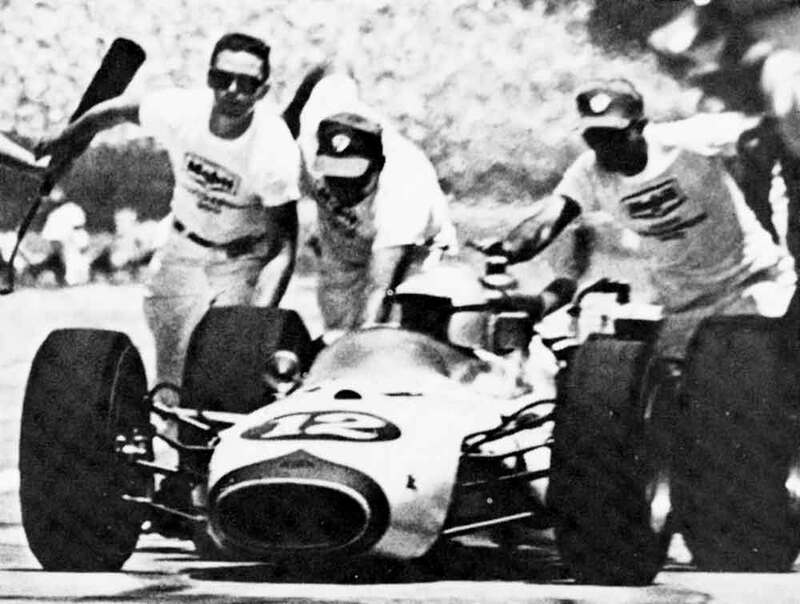 In May of 1965, Mario Andretti qualified fourth fastest and finished third in his inaugural Indy 500, earning rookie of the year honors. 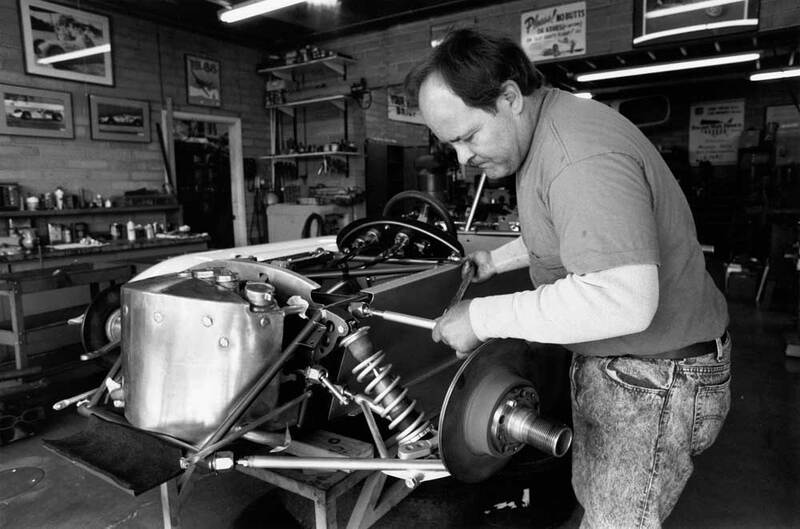 Amazingly, Mario drove the car to his first USAC national championship that season, also the first for a rear-engined champ car. 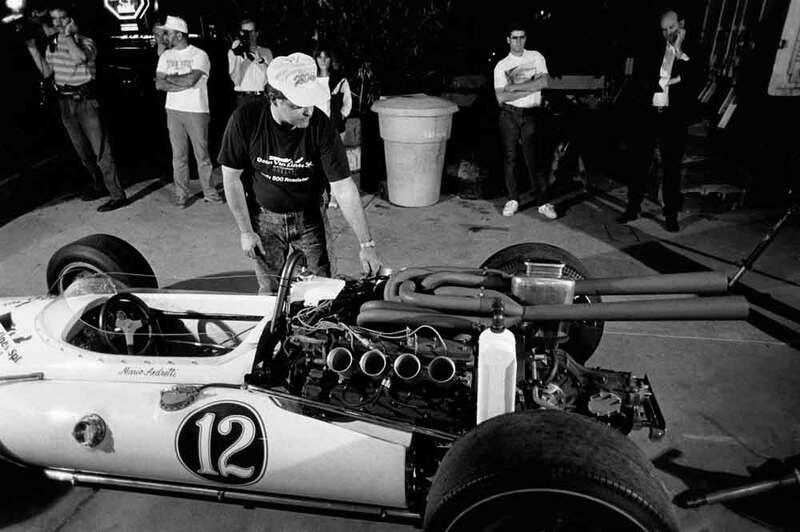 Andretti would later repeat the feat in 1966 and 1969, still at the wheel of Brawner Hawks. 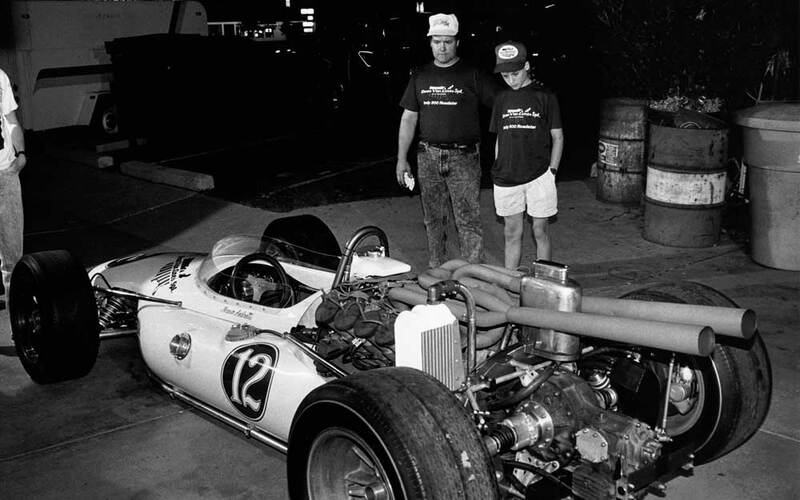 As a tribute to his cousin Clint who passed away in 1987, Tom Brawner and his sons decided to restore the #12 Hawk in 1990. 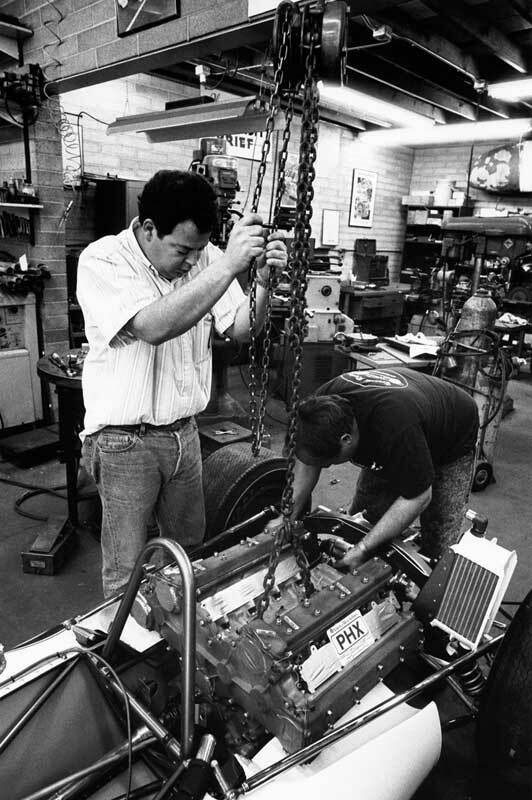 Like Clint, he completely rebuilt the frame from 4130, and hand-formed the slick aluminum and fiberglass body at the very same vintage-fifties race shop in north Phoenix. 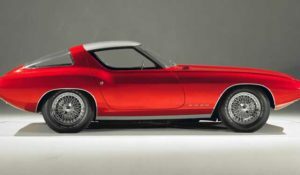 He had the original engine rebuilt by Joe Bogosian, the same builder Clint used, and took great care to paint and decal the Hawk exactly as it had been in 1965. 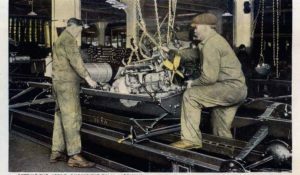 Most of the components, including suspension pieces, wheels, transaxle, steering wheel, instruments, and even the fuel filler cap are original. 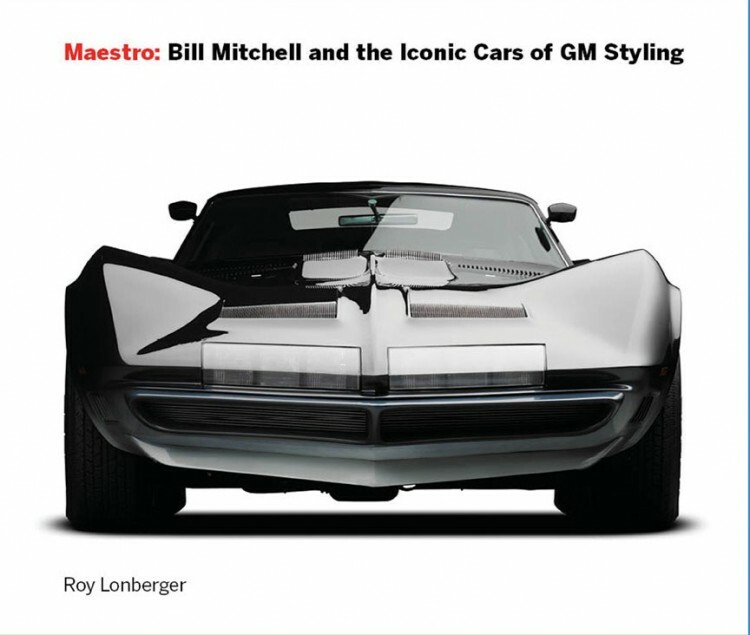 I love the pics of the car! 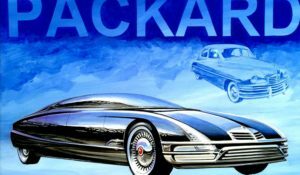 I grew up in phx and was 10 yrs old in 65.i used to work with gene aycock [painting billboards] who lettered one of brawners indy cars in the late 60’s. 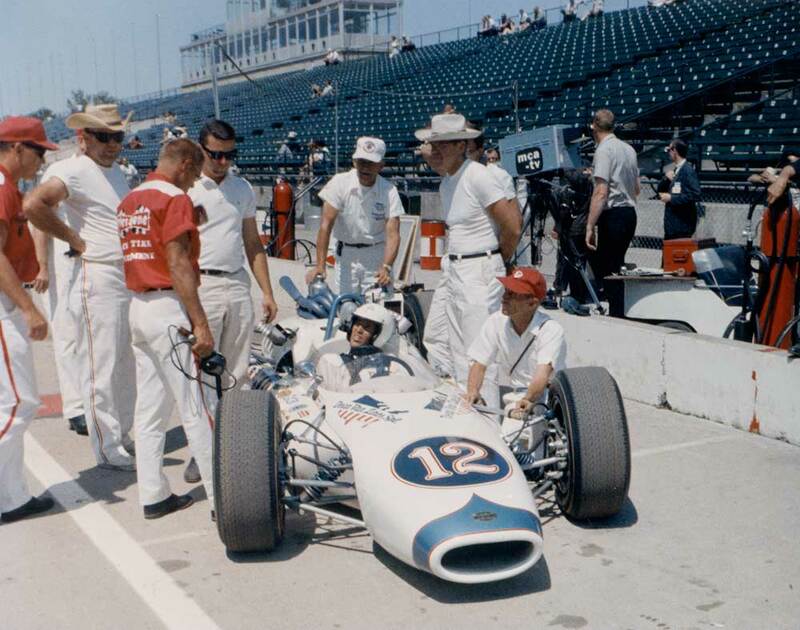 I was privileged to view Mario finish 3rd in the 1965 Indy `500` with the Brawner-Hawk. 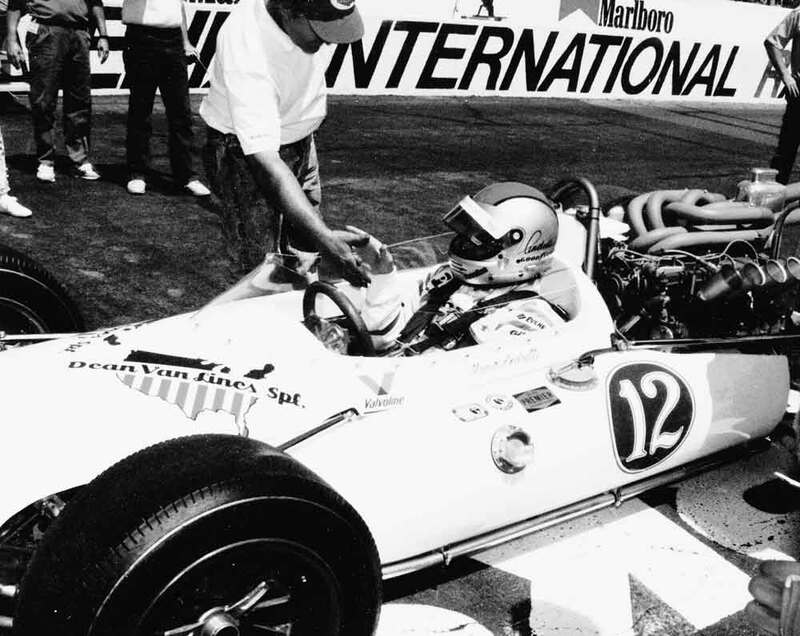 Also did see Mario out-duel A. J. Foyt at RaceWay Park for his first Championship win later that year in `65. 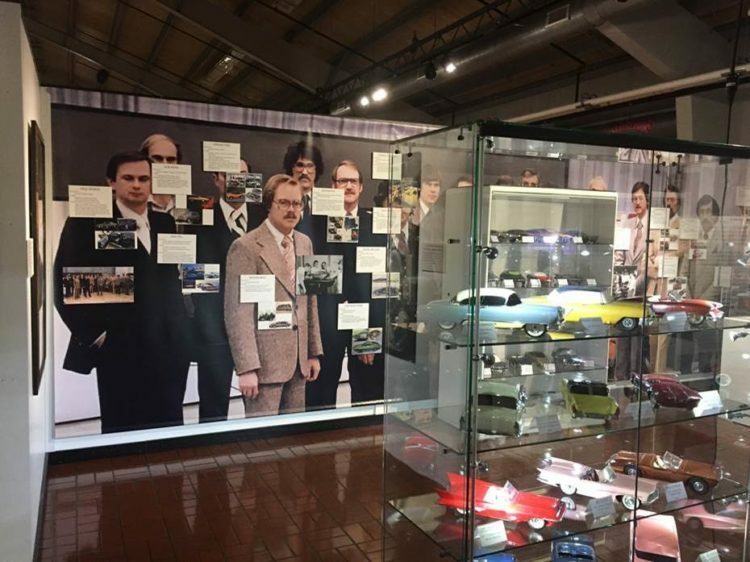 My Father was Senior Vice President and later President of Deam Van Lines, remember when Mr. Dean hired Mario in 1964 after that “Unforgettable Season”. 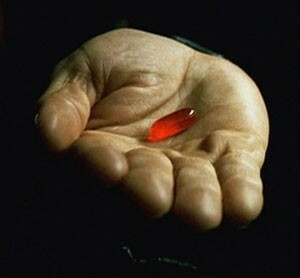 I liked Mario but Mr. Sachs was my Favorite. Rick Shumpert -Dallas, GA.